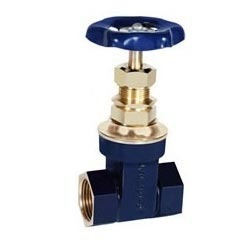 We are a reckoned company in this domain and are instrumental in offering an enormous quality range of Bronze Gate Valve to our customers. These Bronze Gate Valves are petrochemical, pharmaceutical, chemical and milk. In addition, we precisely examine these products with the help of our quality checkers. Screwed in bonnet, Non-Rising Spindle, Solid Wedge. High quality lubricated gland packing. Strictly conforming to IS : 778 Class-I. Provision of re-packing under Pressure. Distinct edge over all other makes available in the market.